As November and December nights draw in, the best Christmas markets spring up all over the UK. Think flickering candlelight, the smell of evergreens, the aroma of holiday goodies, the sounds of carolers and holiday brass bands and children's excitement at the glitter and twinkling lights. From late November to mid-December, glowing market booths and stalls filled to bursting with tempting, exotic goods turn British city and town centers into festive wonderlands. These 16 are tops for original gifts, handmade and artisan crafts, delicious foods, mulled wine and entertainment. Birmingham stages one of the biggest and longest German Christmas Markets outside of Germany. The West Midlands city is twinned with Frankfurt, and the Frankfurt traders go all out to bring real German gemütlichkeit to Britain. It spreads across most of the city's important squares and continues for more than a month. Alongside the German Market, a Christmas crafts fair highlights regional producers and artisans as well as more exotic gifts from Asia and Africa. Add in ice skating, a big wheel and a jewelry market and Birmingham is a very festive place indeed for most of the winter. When: 10 am to 9 pm, Nov 17 to Dec 29, 10 am to 9 pm (in 2016 the festival has been extended beyond Christmas to mark its 50th anniversary). It would be hard to top Manchester's huge Christmas market celebrations, visited by about 9 million people during November and December. Birmingham may have the largest German market outside of Germany but Manchester adds a French Christmas Market, a family market, and arts and crafts market and more. In fact, 10 separate markets flood the center of Manchester with music, twinkling lights, gifts, and good cheer. A markets map on the city's Christmas Market website can help navigate between them. There are 300 stalls in all, filled with gifts, crafts, jewelry, clothes and toys from European and local producers. Where: Albert Square (main German Christmas market and dog-free zone except for service animals), Brazennose Street, King Street, St. Ann's Square, Exchange Street, Market Street, New Cathedral Street, Exchange Square (dedicated family area with a fun fair), Corn Exchange, Cathedral Gardens. Edinburgh's taste for festivals - possibly sharpened by its fabulous summer of arts festivals - means the city celebrates everything enormously. Christmas in Scotland is still not as big a holiday as Hogmanay, but things are catching up. Two Christmas markets offer visitors and locals a stellar choice of original shopping, good food, and drink. that extends from November all the way past Hogmanay in January. European stallholders bring food, drinks and handmade gifts to the European Christmas Market in the Mound Precincts. The European Market will stretch from the Mound and along the East Princes Street Gardens to the Scott Monument. The Scottish Market on West George Street offers all sorts of locally made food and drink, chocolates, sausages, and cheeses, along with Scottish crafts in textiles, jewelry making, and woodwork. Where: The Mound, East Princes Street Terrace and Gardens and West George Street. Leeds is such a great shopping city; to begin with, a Christmas market seems like icing on the cake. Or on the German lebkuchen actually, because there are bound to be some of those traditional German Christmas cookies among the 40 genuine German stalls that fill Leeds Millennium Square for more than a month - from mid-November onward. The market is organized by the City Council in partnership with Frankfurt am Main and it turns the city's Millennium Square into a wintry alpine village for the duration. Lots of crafty things to buy and plenty of good things to eat - including such German delicacies as stollen, gingerbread, goulash, soups, schnitzels, bratwurst and, of course, gluhwein. New in 2016, a central, open-air performance area with live entertainment and Sunday morning Santa's Breakfasts for the family. Lincoln started the tradition of German Christmas Markets in Britain 33 years ago, giving it the distinction of being the first. It's also probably the most concentrated and intense, cramming hundreds of thousands of shoppers onto Lincoln's medieval Castle Hill for just 4 days (so no dogs except assistance dogs allowed). What started with 11 stalls has now grown to 350, filling this bijoux cathedral city to bursting. A very good place to get in the holiday spirit. Where: Castle Hill between Lincoln's Norman Castle and it's Gothic Cathedral. The Christmas Market phenomenon in the UK may have started in the provinces but it didn't take London long to catch up. The city now has several Christmas markets to add to its many other opportunities for festive shopping. One of the best is the Southbank Centre Winter Festival (in its 9th year in 2016), from mid-November to early January. The traditional, German-style chalet stalls stretch along the riverbank and the reflection of the sparkling lights in the River Thames makes it extra special. After the holiday markets are over, more winter festivities continue along the Southbank well into late January. It is, of course, only one of London's Christmas markets. Getting to the Southbank - London Underground stations at Westminster, Embankment, and Temple (north of the river) and Waterloo (south of the river) are all within easy walking distance. In keeping with its status as one of Britain's World Heritage sites, Bath boasts 170 stalls and a totally British Christmas Market. At least 85% per cent of the stall holders are from Bath or the surrounding area. And 89% of their goods are created by local Bath artisans, makers, and producers. Bath's Christmas Market stays open late to make the most of its setting, next to Bath Abbey and the Roman Baths. For 18 days at the end of November and early December, original crafts and goods - clothing, glassware, candles, artwork, even goodies for Fido - are sold from wooden Christmas chalets. Bath's Christmas lights, the aroma of mulled wine and pine needles, all make for the storybook atmosphere. There's a lively program of street entertainment and in Wi-Fi is available at the market. When you're there, find the Bath Christmas Market Network, log on for £1 a day and tweet market pictures to your heart's content. Where: In the city center in the streets and squares around Bath Abbey and the Roman Baths. Forty-five wooden chalets feature in Bristol's Christmas Market, selling food, drink and German craft goods including Christmas decorations, nativity scenes, wooden toys, baskets, gifts, soaps, and amber jewelry. There will be plenty of traditional, festive goods - gluhwein, bratwurst, waffles, crepes, apple rings, chocolates, and cakes. Look out for the traditional German Christmas pyramid-style Nativity scene, a giant Advent calendar and, a German beer garden. Most years. there's live entertainment as well. Where: In Bristol's Shopping Quarter, around Broadmead. Bury St Edmunds Christmas Fayre by the Cathedral. The dramatic St. Edmundsbury Cathedral and precincts are the setting for the Bury St. Edmunds Christmas Fayre, five different Christmas markets on the last weekend in November. Sadly, they really should call this the Bury St Edmunds Thanksgiving Fayre because it's over before many people have even begun to think about Christmas. Still, you could consider it a Black Friday treat. They pack in 300 stalls and thousands of visitors over the four days. It's all very sparkly, with lots to eat and buy as well as street entertainment and a chance to see the historic core of this pretty East Anglian town in Suffolk in its holiday finery. In its 14th year in 2016, the Cheltenham Christmas Market has 40, newly designed chalets and a range of high-quality goods in keeping with this upmarket town on the edge of the Cotswolds. Shop for woolly hats, felt bags and costume jewelry, award-winning fruit wines, freshwater pearls, handmade Christmas decorations, toys, fair trade knitwear, interesting historic foods - including Roman vinaigre, ostrich burgers, pashminas, wood carvings and loads more. Chester, in Northwest England, with its wealth of half-timbered medieval buildings and it's ancient "rows" of bi-level shops, seems just made for a Christmas market. The tall, sparkling tree is the centerpiece for 70 traditional wooden chalets offering clothing, jewelry, craft gifts, food and drink from local makers. It's open seven days a week with late shopping hours on Thursdays, Fridays, and Saturdays. Chichester, one of the Southeast's most interesting cities, invites more than 50 stalls to fill its busiest pedestrian shopping streets with festive fun for nine days in December. The market centered on Chichester's market cross offers one-of-a-kind pressies. Don't miss the live Nativity scene, complete with donkey, outside Marks & Spencer. Where: Pedestrian shopping area around the market cross on East and North Streets. Exeter in Devon held its first ever Christmas Market in the grounds of Exeter Cathedral in 2012. About 50 small local producers, artisans and craftspeople along with selected independent dealers now offer everything from roast hog to Bavarian beers to Belgian choccies. In 2014 this market won the Best Specialty Market award of the National Association of British Market Authorities. Besides the Cathedral Green Christmas Market, more holiday markets run on Fore Street and Castle Street in the city center. Salisbury dips its toes in the Christmas Market pool between late November and mid-December. In the five years since the first Salisbury market, with a handful of traders, the market has steadily grown. Today there are 76 Tudor-style chalets featuring genuine British arts and crafts from hand-picked exhibitors as well as a popular lantern procession. While you shop and nosh on holiday goodies, local choirs, and music groups will entertain daily. Keep a lookout for some unusual food and drink from local producers - Wiltshire chili jams, chocolate wine, Lancashire cheese bombs, and toffee vodka. This is one of the countries newer markets, popular almost from its beginnings, ten years ago, in 2006. There are more than 100 exhibitors sharing the 80 chalet stalls and selling all kinds of festive goodies. An ice skating rink adds to the evening buzz. But it's the atmospheric location that really makes this event. It takes place within the Inner Cathedral Close of Winchester Cathedral which dates from before 650. York has Northern Europe's largest Gothic Cathedral and a treasure trove of Medieval architecture, so it's no wonder that the folks here get so carried away at Christmas. There are Christmas markets all over town, plus an early music concert, carol concerts in York Minster and an angel festival with ice sculptures. Within the walls of this little city, the holiday spirit takes over from mid-November until around Christmas Eve. The major event, the St. Nicholas Fair, takes place at different locations around this small, walkable city. 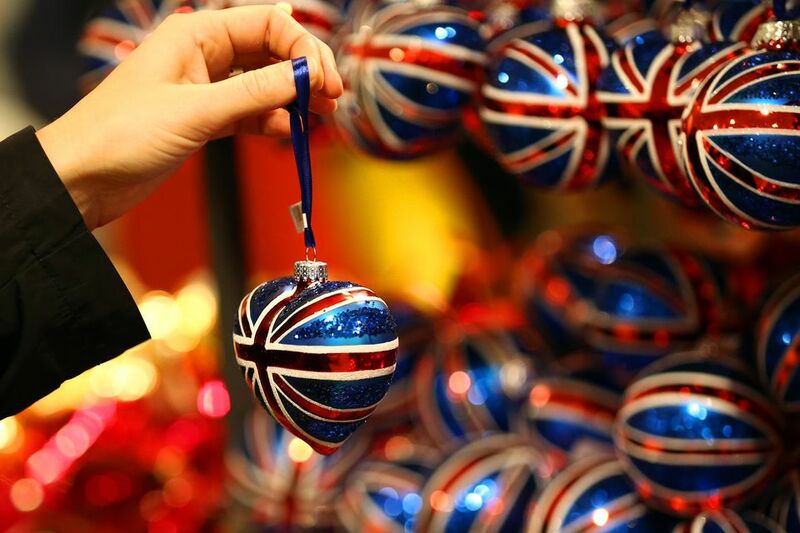 You can follow a trail and buy British crafts and artwork, food and drink, holiday ornaments, jewelry, and all sorts. Where: Parliament Street, St Sampson’s Square, and The Judge’s Lodging; Davygate, Coppergate, and The Shambles. Is York England's Most Christmassy City?